When life on earth developed, symbiotic associations arose as a successful strategy millions of years ago, with which organisms of different species cooperate as a close-knit community, to gain an advantage in the struggle for survival. However, we still largely do not know why they do this, what the real benefits of such partnerships are, and which molecular mechanisms are important. Scientists from the Collaborative Research Centre (CRC) 1182 “Origin and Function of Metaorganisms” at Kiel University (CAU), together with Japanese researchers from the Okinawa Institute of Science and Technology (OIST) and Okayama University, have now presented the first comprehensive characterisation of symbiotic interactions, using the example of the cooperation between the freshwater polyp Hydra and the Chlorella algae living inside its cells. Their results have been jointly published in the current issue of the internationally-renowned scientific journal eLife. In order to investigate the fundamental mechanisms of this symbiosis, the research team focused on the metabolic relationships between Hydra and its algae symbiont. The organisms live in a so-called photosynthetic symbiosis: the algae provide their host with certain metabolic products which they obtain from the conversion of solar energy. In return, they obtain nutrients from the polyps which they cannot acquire by themselves. “This form of coexistence between cnidarians and algae is an extreme form of symbiosis, in which the algae can no longer survive without their host. The symbiotic algae even give up parts of their own genetic information, and instead use the corresponding structures of the freshwater polyps,” explained Professor Thomas Bosch, cell and developmental biologist at the CAU and spokesperson for the CRC 1182, regarding the extent of the co-dependence between the species. The Hydra are also highly dependent on their symbionts, since the Chlorella colonisation boosts their reproductive success, so the organisms’ viability would be at a considerable disadvantage without the algae. “Our results also show which specific tools are required at a genetic and molecular level to ensure that a durable and stable symbiosis can develop in the course of evolution,” continued Bosch. On the one hand, laboratory studies revealed that the presence of the symbionts led to significant up-regulation of certain Hydra genes responsible for the metabolism, boosting the nutrient transport between host and symbiont. On the other hand, analysis of the genome of the symbiotic algae revealed that the symbiont is missing the genetic components required to utilise nitrogen, so that the nutrient supply must be partly taken over by the host. Overall, this new publication answers one of the most important research questions in the first funding phase of the CRC 1182: the driving forces behind the evolution and long-term stability of a symbiosis. The analysis of the interactions between Hydra polyps and algae makes it clear that the co-evolution of organisms can be driven in particular by the possibility of mutual nutrient exchange. The scientists in Kiel, together with their international colleagues, now plan to build on the results of their research and investigate more complex, multi-organismic interaction networks. A better understanding of the symbiotic relationships between cnidarians and algae is not only valuable in terms of basic scientific knowledge gained, but can also serve as a model for the assessment of climate change, associated with the change of marine ecosystems: corals, for example, are greatly threatened by the impact of global changes since their ability to absorb nutrients is dramatically affected by changes in the nutrient content of sea water. In turn, the diverse, vibrant, tropical reef-based communities depend on the health and growth of the corals. As corals – like freshwater polyps – are dependent on certain symbiotic bacteria for their nutrient uptake, a more accurate understanding of the underlying mechanisms is required. Further research is necessary to determine whether the new knowledge gained is also applicable to the symbiosis of corals and bacteria, and if this can lead to possible future adaptation strategies for protecting endangered tropical coral reefs. 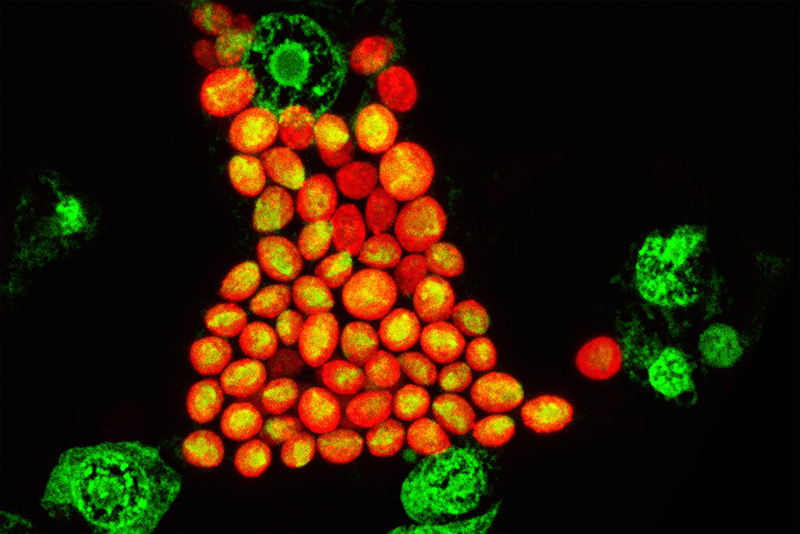 Caption: Microscopic view of Hydra-cells (nuclei appear in green) containing about 20-30 symbiotic Chlorella-algae each (in orange).